Promoting one's business through social media is what most people do. This blog, that I so enjoy, promotes Handmade Happiness, the shop. Most of the photos I put up on Instagram are taken in the shop of things you can buy and yet it all seems too much fun to be called work. It still seems incredible to me that many people make their living through social media - buying and selling online. Something they don't have to leave the house to be successful at. If you've got a good eye and feeling for what people want - why not? A successful Etsy site or trading on E-bay is a form of work. But somehow I can't bracket it with going in to the factory or sitting in an office each day. It's work lite. Ironically you can probably make more money with social media than you can on the assembly line and I know what I'd prefer to do. When I did a bit of voluntary work for AgeUk I was fascinated by the individuals who came in early every morning to sniff out a particular sort of pottery or glass or jewellery that they bought to re-sell on e-bay. They were each specialists and knowing a lot about one particular thing is what their business was based on. Respect to them. But is this work in the way that someone who cleans other peoples' houses works? Work lite again. By the way I'm closing my Facebook accounts. Too many emails, too much trivia and I'm just not posting on it to make it a worthwhile experience. I hate the fact that if someone types Handmade Happiness in to Google, Fb is the first thing that comes up. I'd rather this blog or Pinterest or Instagram came up. I can see it works for many people but it just doesn't suit me. How do you feel? When I started this large piece of needlefelting I wanted to make a bag out of it.But now I've stitched into it (hard to see the stitches, I know) I want to do something else with it. Exactly what I don't know right now. Ideas? Enjoy the sunshine! This means looking at beautiful, expensive stuff so that when you are in cheaper stores (or charity shops) you recognise quality. As you get older you realise what you like best and they say that if you only buy what you really love your house will look right because everything in it will be your own taste and therefore fit together. In the window today. Jugs and mugs by Justine Jenner; hearts by Kate Hackett and wrist warmers by Kate Box. 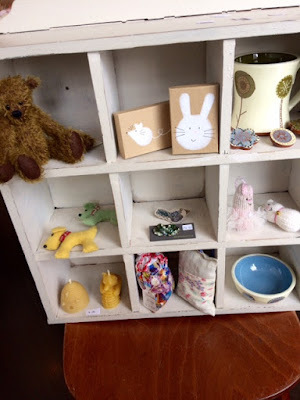 Bear by Lindsey Agostinelli, gift boxes and knitted bunny and cat by Sue Inglis; pottery by Samantha Robertson, dog brooches by Karen Boller, lavender bags by Brenda Tilbury and beeswax candles by Elizabeth Eveleigh. Tomorrow is Mothers' Day in the UK and Dads and children are looking for a little gift to show their appreciation! The sun is shining and I wish you all a wonderful weekend and a Happy Mothers' Day! Yesterday I felt like making a purse from a piece of my needlefelting as an experiment. The needlefelting is rather thick so I thought I'd compensate by using a fine piece of printed silk as the lining. Last week Carol Smith showed Brenda Tilbury, Pam Dew and I how she makes lined, zipped purses and after making a cotton flowery one for my grandaughter during the week I'd forgotten how to piece the whole thing together. Carol patiently showed me again and this is the result. If I make any more I'll hand-stitch across the needlefelting before sewing it to the lining to add interest and to make the whole thing more secure. I will also make the needlefelting thinner and the lining a thicker silk because the silk lining I used was slippery to sew. I confess I've recently got hooked on Instagram. If you've got the Ap you can find me as jenny_handmade_happiness. If you want to get the Ap it's free to download. 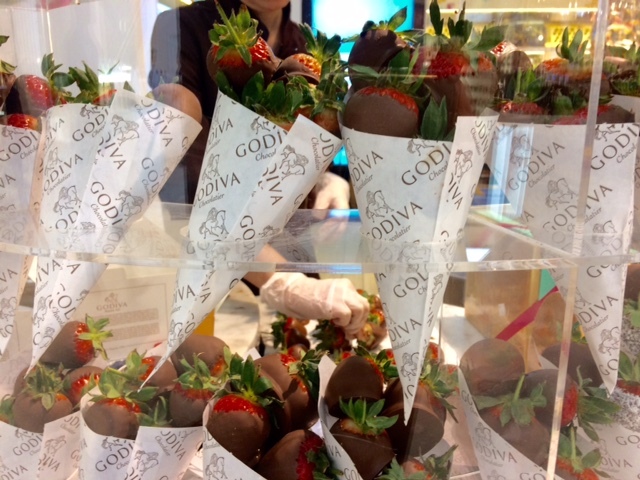 Warning - it's addictive. I also enjoy Pinterest where I'm jennystacy17. I think I must set my timer before looking at Instagram or Pinterest in future, otherwise it's amazing how quickly time passes when you're having fun and what I'd prefer to be doing is writing! A second blog about diet and lifestyle ? That would also be fun. 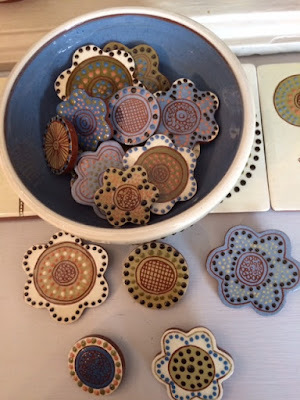 Samantha Robertson has made these new ceramic brooches priced between £6 and £10 depending on size. Justine Jenner has delivered more brightly coloured mugs to the shop. I've not stocked ceramic brooches before and it will be interesting to see how they sell. The price makes them an ideal little gift for a friend who appreciates an individual, contemporary look. Justine Jenner's work seems to divide into three very different looks: Grey speckled, sea colours and bright inside. Again, a look that's very 'now'. Since the start of tv's The Great Pottery Throw Down there is a renewed interest in ceramics generally and many more people wanting to take up the craft. Samantha Robertson, who teaches pottery in Farnham tells me there is a waiting list for her classes. I also enjoy the educational Painting Challenge on Sunday evenings. These programmes make us want to have a go to see what we could (or could not!) achieve... Those programmes also make us appreciate that it's not easy. Every craft demands dedication and the willingness to practice, practice, practice. But with determination and flair, doing anything well is so rewarding! New baby cross-over top and cardigan and cashmere bonnet with ribbons all knitted by Patricia. Love this little grey top for a newborn girl or boy. Handmade Happiness is lucky to have good knitters among its makers, and with babies in my own family I am always being tempted to buy the beautiful clothes that I receive. I feel that everything should have a chance to be bought by other people first but, after a couple of weeks of being offered for sale, I reckon this gorgeous top is coming home with me! One of the joys of visiting France is looking at the babies and childrens' clothes in the shops. In the past I have bought those white long sleeve tops with rounded collars that popper up at the back and the simple knitwear that looks almost hand knitted from Monoprix. In this country I think Zara and Next, sometimes Marks and Spencer have nice baby things. I like babies to look like babies in white or pale colours. I'm not a fan of slogans or the characters from films being plastered over clothes for little ones. When my elder daughter was expecting her first and I wanted to knit and sew some baby things we visited Liberty for inspiration. The helpful lady in the knitting department recommended the knitting patterns by Erika Knight and having used them myself, I would also recommend them to anyone wanting to knit for babies. I've used her book 'Simple Knits for Cherished Babies' many times when knitting for my own grandchildren and they've always turned out well. I tried to share 5 pictures with you but apparently the blog inbox is 'Full' so it will only publish one picture. I wonder if after 8 years of blogging I have reached my permitted limits and will have to start a new blog from scratch? I'll keep you posted. Audrey has knitted dozens of little hollow chicks like this. £1.50 each complete with Lindt egg. The rag rug is one of two. I love the colours Ruth has used. 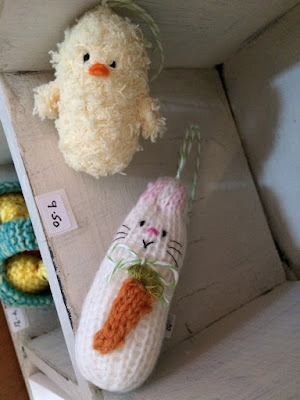 Sue Inglis has brought in an Easter tree with knitted rabbits, chicks, carrots and pompoms on. Tree decorations are £4.95 and pompoms 60p. Picture to come. Camilla Flint, whose fashion illustration cards I sell, has an exhibition of her work in the cafe at One Tree books, Petersfield. Do take a look if you live locally. Pictures (fingers crossed) to come. Close up of beautiful dried roses and gold heart made by Brenda Tilbury. Handmade Happiness is grateful to Brenda Tilbury, also known as Queen of Wreaths. She makes the giant hearts and stars that you see hanging from the flagpole outside the shop. Tomorrow, weather permitting, she'll be attaching a twig garland that looks a bit like a spinning Catherine wheel to the flag pole.It looks great and will certainly attract the attention of passing car drivers and pedestrians. Brenda also makes popular gold leaf and dried flower cards as well as all sizes of wreath displayed in the shop. The gold sparkle Congratulations banners are also available, priced £9 each. Seen in the top picture is a branch that Brenda has covered with handmade felt blossoms. They look so realistic and will remind everyone that Spring is coming soon! Ps. Audrey, who knits the popular Easter baskets with two chicks and three chocolate eggs in,(see post below) dropped by today with fresh makes. They will be for sale from tomorrow, Saturday. Audrey has knitted chicks in baskets. Kate Hackett's daffodil mug below. Love this jewellery by Annie Sherburne. When I re-did the window this week I was thinking of Mothers' Day, Spring and Easter. Audrey brought in the little Easter baskets with two chicks each containing a Lindt egg ie. egg inside each chick and another in the basket waiting to hatch! They sold out in one day! I've put two more in the window that I didn't have eggs for so just two left! Sue Inglis is busy knitting Easter themed decorations and these will soon be hanging from some twisted willow branches. I've made some cashmere decorations that are also selling well even though Easter isn't until mid-April this year. Today it has rained nearly non-stop but I really need to get out before the shops close. I hope you are enjoying your weekend in spite of the rain! One giant ball of wool will knit a whole baby blanket! Cast on 30 stitches and knit a square in whatever stitch you like. I've started off with the most basic stitch - knit or garter stitch. Then carry on (don't cast off) in another stitch - say a cable or a lace stitch or a rib - and when you've knitted the same number of rows as the first 'square' change to another stitch. Make other strips knitting as many different stitches as you know or want to attempt. Then finally sew all the strips together. I did this for my first grandchild in natural white handspun wool from the shop. This grey ball is mostly acrylic with just 20% wool which means it should stand up to repeat washings in the machine.